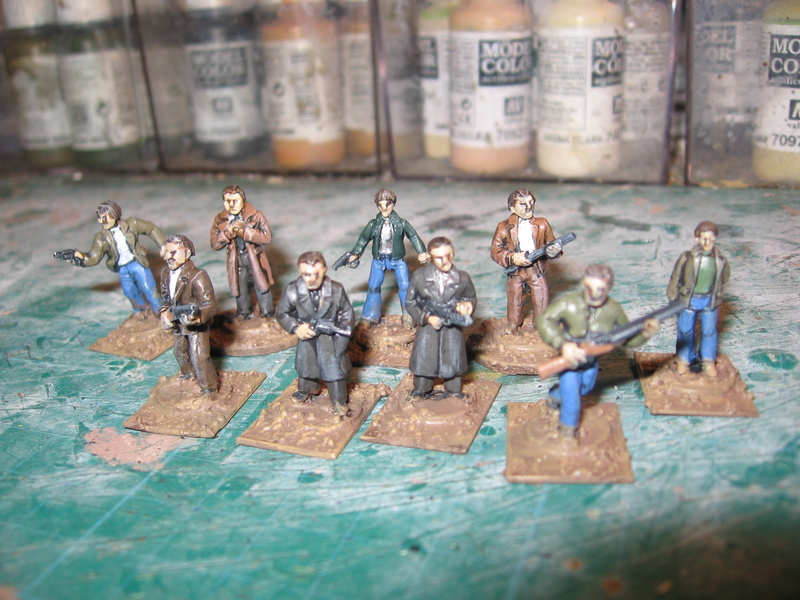 … been a productive month this April, painted over 100 20mm figures. First up a Under Fire Miniatures Soviet sniper- quite pleased with how this one turned out- she wasn’t speed painted like everything else I do. 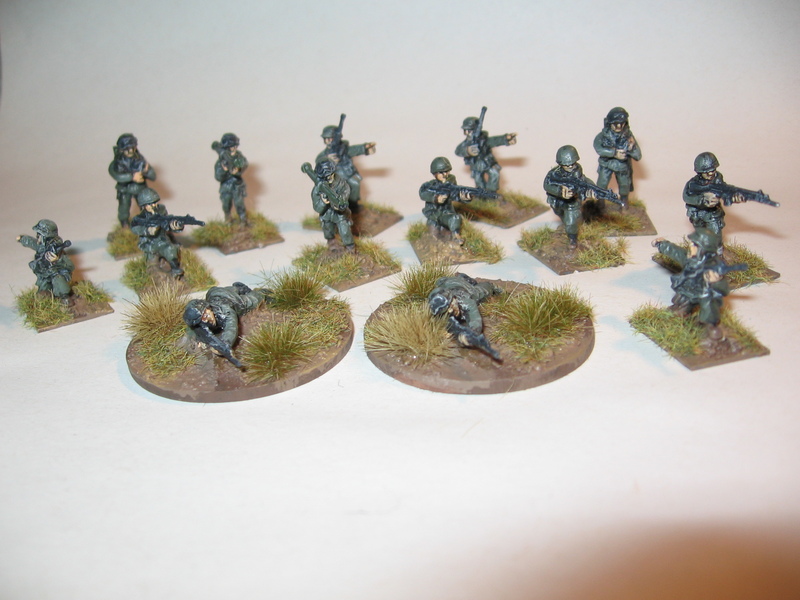 A batch of MJ and Liberation Argentinians for the Falklands War. 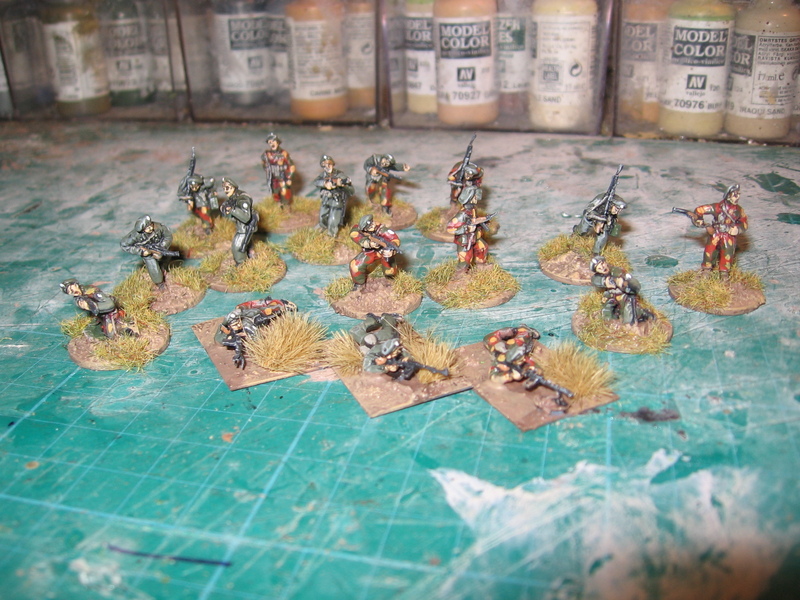 Lastly, a bunch of Liberation and Under Fire modern Russians. 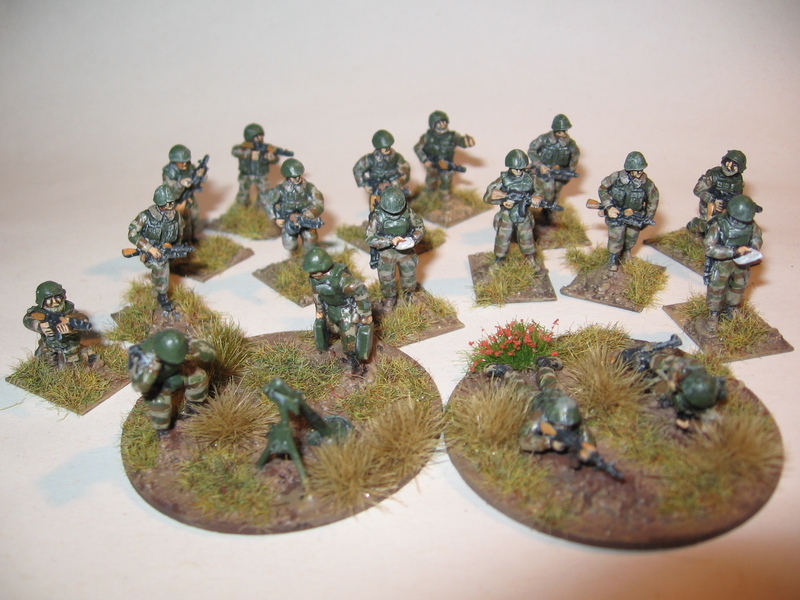 This makes a 1 to 1 company of them I’ve got finished for my long running Chechnya project. A little bit of Italian…? Just a few quick pictures tonight of some Italian bits fresh from the shed. 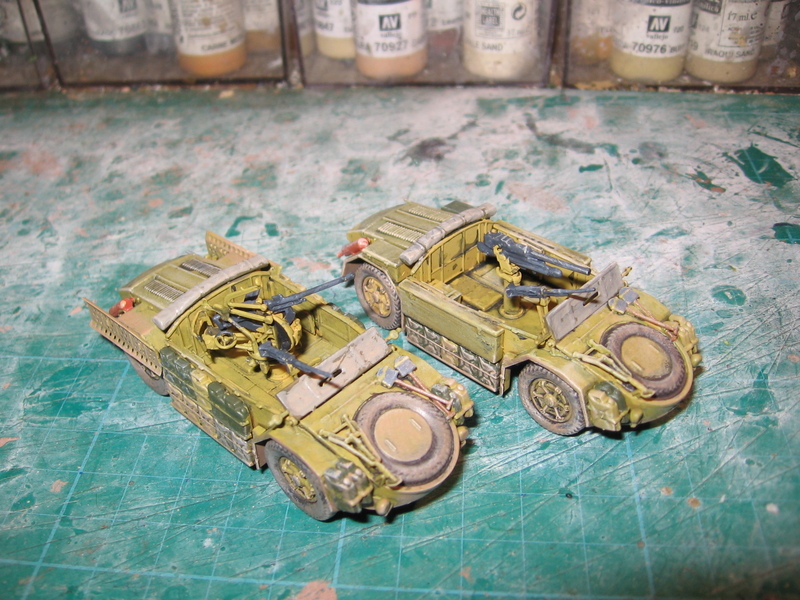 First up a pair of Italeri 1/72 Sahariana scout cars. 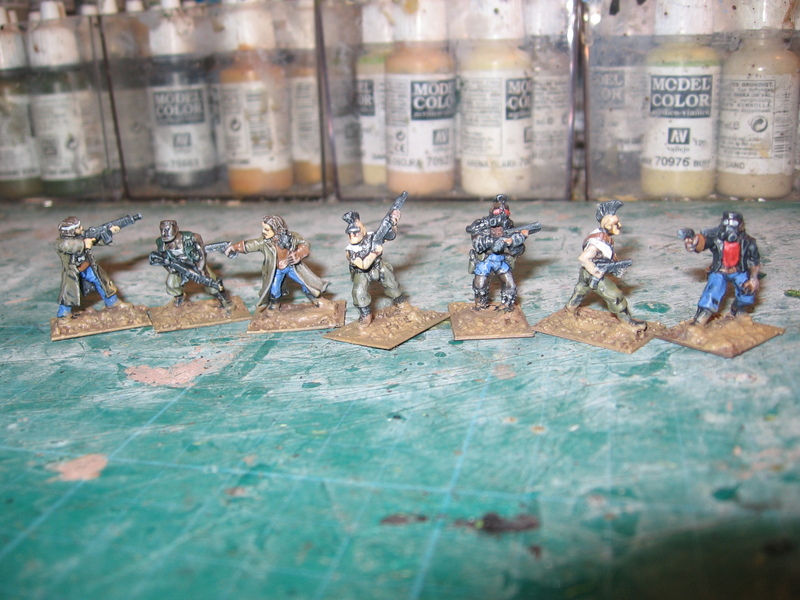 A small selection of CP Models Decima Mas infantry for the RSI period of the war. 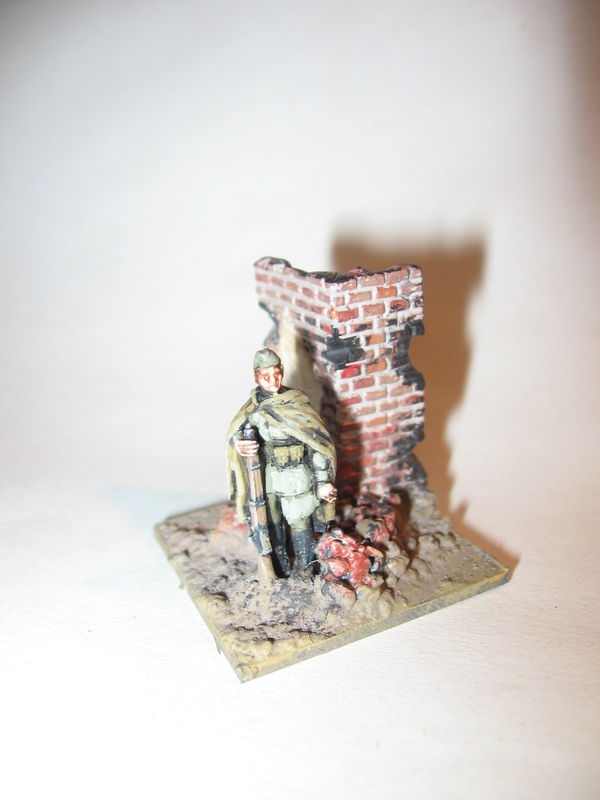 I can see these figures being used in either an Anzio, Gothic Line or anti Partisan themed games in the future. 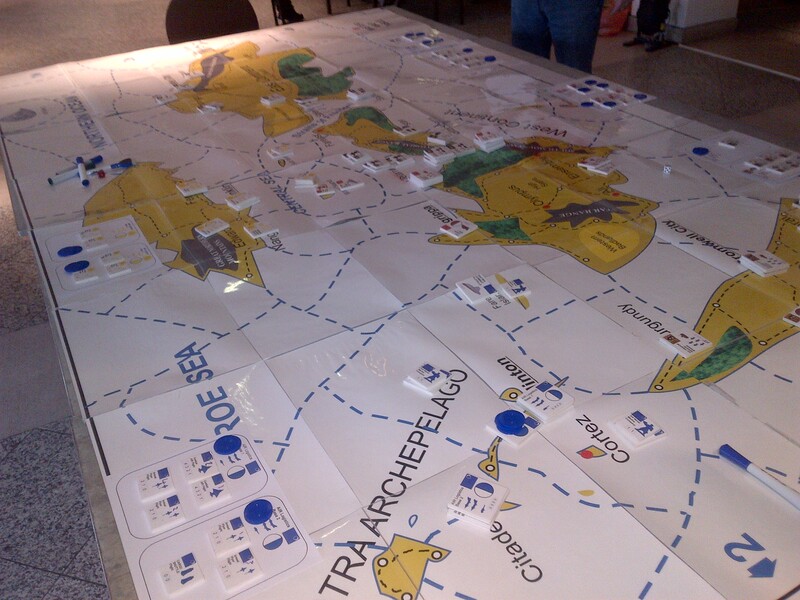 Invasion from Mars Megagame, Leeds 13th April. Last weekend, Brian, Chris, Evan and I headed off early to Leeds’ Royal Armouries Museum for another of Jim Wallman’s excellent megagames. This time the scenario came from ‘The Universe’ a setting that Jim and others have developed out of a continuous 18 years of game play. The colony of New Cydonia, home to 5 island group and corresponding factions, has been at war for some time with the militaristic ‘Democratic Republic of Cydonia (a militaristic dictatorship) had started a two front war against the ‘Diggers and Miners Collective’ and the ‘New Cydonia Colony’, to the north the ‘Independent Development Association’ and ‘North Continental Company’ watched with concern as the conflict threatened to escalate. The escalation was in the form of the Martians who were heading to the colony to sort the situation out for their colonist in the form of the ‘New Cydonia Colony’. Brian, Evan (in his first megagame) and I all played military commanders from the DRC, rounding out are team was the President for life- played fantastically by Tim Campbell. Chris was orbiting the planet in the space station that functioned as the colonies trade link to the rest of the galaxy. Evan and I started the game engaged on two different continents with somewhat depleted armies, whilst Brian stayed on the home island as our reserve. 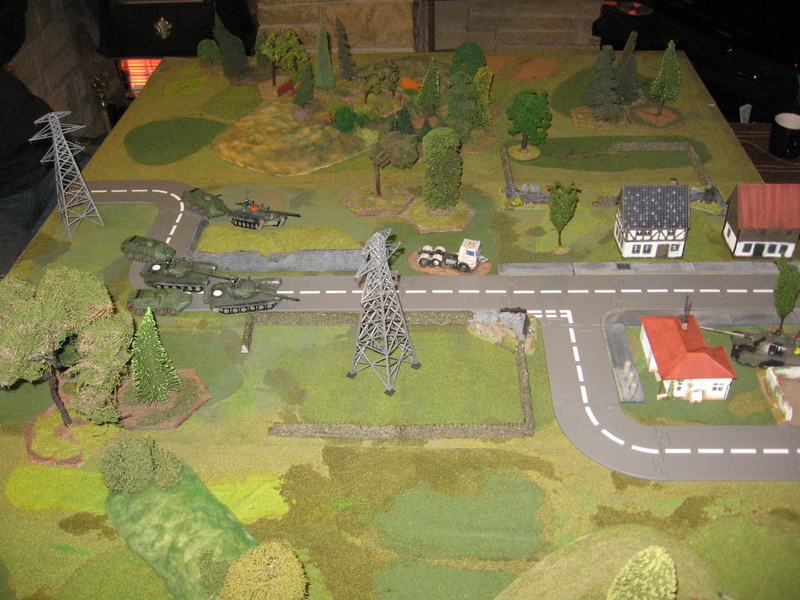 The game played very simply, plan write orders, then carry out all moves on the main map simultaneously supervised by the control team. Evan and I started fairly aggressively trying to expand our initial gains with a view to a better position for our President in the anticipated peace talks. 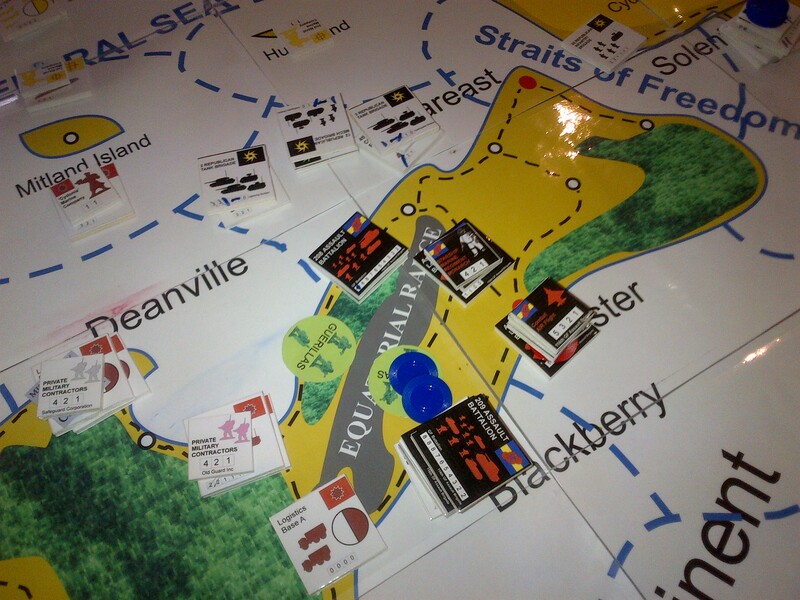 Evan pulled of a clever outflanking move by using his Sea lift assets and did quite well though without making contact. I however ran straight into the NCC counter attack and in the ensuing encounter battle came out very badly (Whilst stronger on paper I was weaker in air assets especially Air Superiority fighters with shot down all my CAS assets. Whilst I was licking my wounds the Martian fleet had been sighted in Orbit, knowing I was number one target I withdrew my forces, giving up some ground admittedly, to the cities to protect my logistical tail. 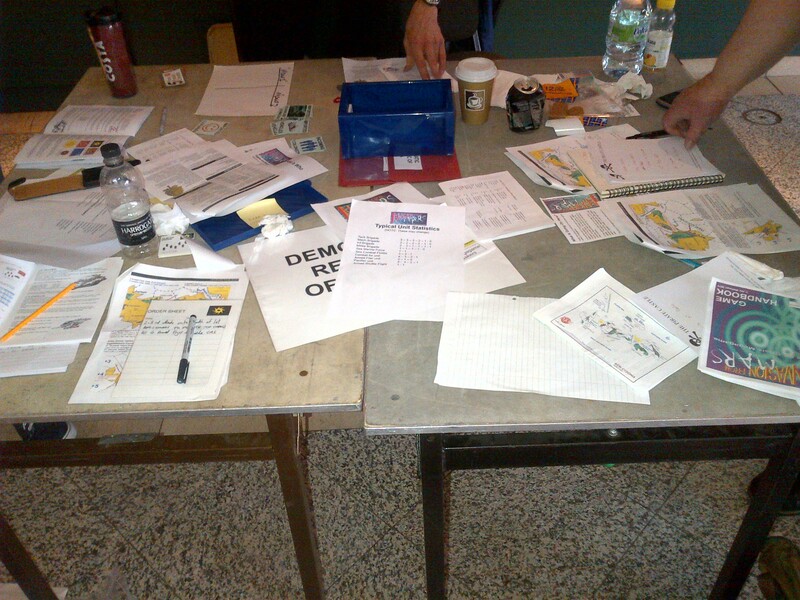 Organized chaos on the DRC table. Whilst this was going on the President was running around doing some pretty crucial deals and agreements with the other player factions, none of us were privy to what was going on, we simply briefed him on the situation, planned, then tore up the plans when he came back after negotiating an advantage for us which meant our planned offensive had to be scrapped as it would upset his deal… all good fun. However he couldn’t do enough to stop the Martians invading in force. Using Orbital bombardment they attacked all three of our forces and landing en masse to face mine, cutting me off from my escape route. The massive Martian invasion force, you may be able to make out the discrepancy between our relative strengths on the counters. At this point with my forces cut off, out of supply and having suffered heavy losses I was offered terms of surrender by my opponent on the NCC. The defence Minister offered free passage for all of my men if I left all my heavy equipment behind. whilst I tried to nail down the specifics of the deal the offer was withdrawn (I was stalling as I didn’t want him to take all my AFVs which I knew he didn’t have). Still like I said at the time we are playing a war game not a surrender game. Therefore my alternative was to conduct my own little ‘Operation Dynamo’, as my three naval flotillas had escaped the initial Martian attacks. I managed to get two tank divisions and one mechanized division off in my boats, the rest off the men who couldn’t make it off in the boats, stripped all the light weapons from their vehicles, blew up what they couldn’t carry and headed to the hills as Partisans to harry the NCC’s supply lines and allow the rest of the army time to escape. In all I hadn’t done very well- the Martians were several orders of magnitude more powerful than I, I had gone in with a Corps and came out with little more than a brigade… As I sailed back to my home island, being attacked from orbit, I pondered my fate, with my army in tatters I was effectively out of the game. The invasion of my home Island was a distinct possibility but one that was out of my control, would the remnants of my force be used as a last ditch defence? It was some comfort that I had managed to dint the Martians, against all odds my Guerrillas had shot down some of their ultra high tech fighters. Meanwhile, as I floated back feeling despondant, President for life had pulled of anamzing piece of bluff and diplomacy and managed to get us off the hook by compling a dodgy dossier that blamed the Diggers… sound familiar, which neatly deflected from the fact that we had launched an unprovoked war of aggression…. Hostilities were wound down and the Martian stopped trying to wipe us off the map from Orbit, we almost got away with it but we were rumbled on our faked evidence. Sent home with our tails between our legs we had to re build our country and economy. Both us and the NCC paid a heavy price in treasure in our exertions. As far as the game Universe is concerned we played an infinitesimally small part, and a part of the game’s history that had been and done. Some 50 years after this scenario was set the planet becomes a full colony of the Martians. Oh any my Guerrillas that I left behind? They were such a stubborn thorn in the side of the NCC that they were eventually paid off and bribed to leave their continent. All in all another classic day’s gaming. 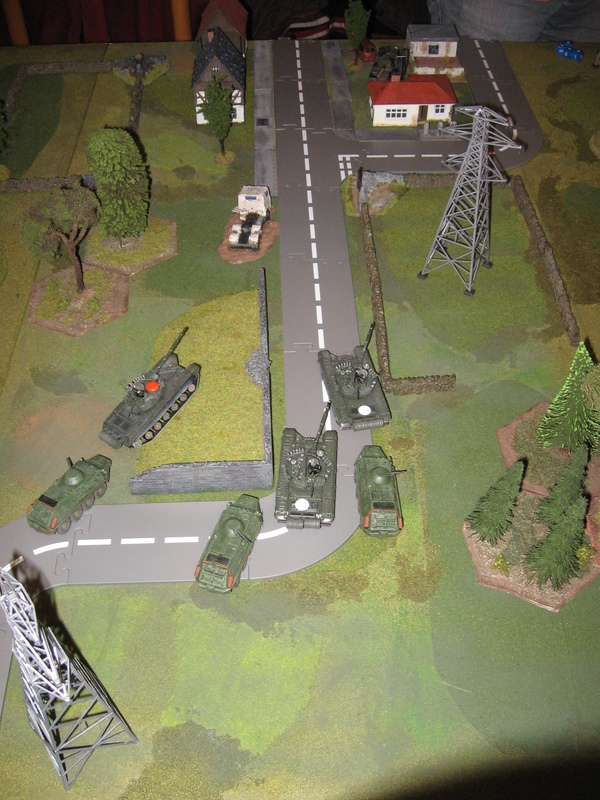 All the players and control team made the day great fun, with an interesting scenario mixing high level military planning with political dealing. I’m looking forward to the next one later in the year… WW2 in the desert. Here are some pics of the latest items that I’ve finished working on. 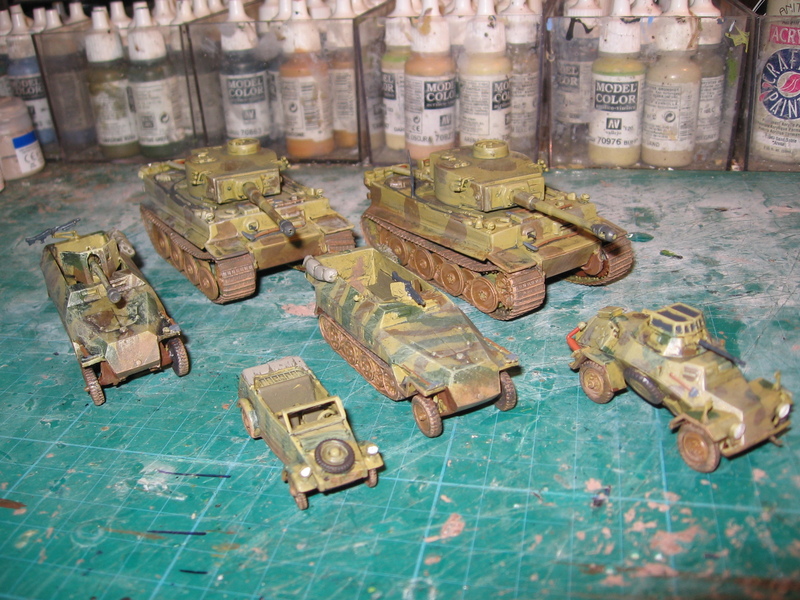 First up a selection of late war German vehicles (The Kubel isn’t mine it is for Bill/Westy of UFM’s collection). Now that I’ve got 6 Tigers painted I can do a NWE game that I’ve always wanted to do: every German tank is represented by a Tiger until properly identified by the allies. 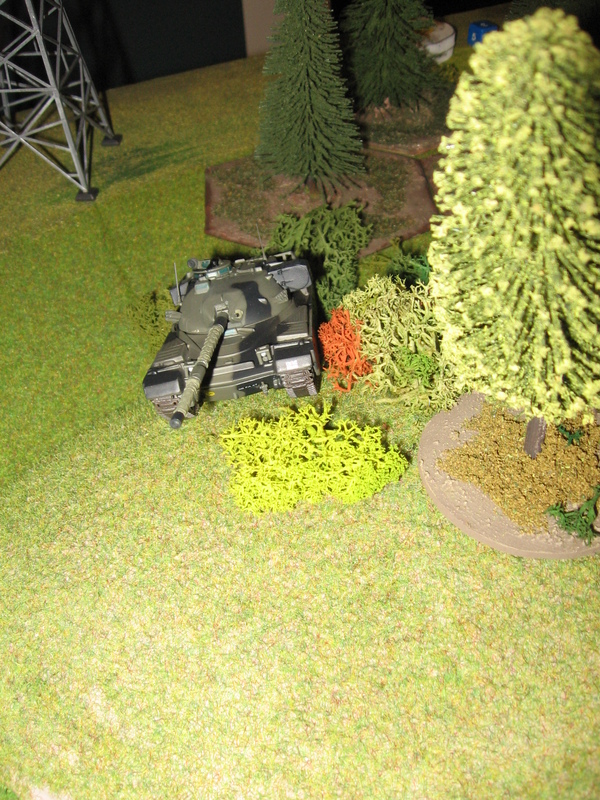 This represents the number of times Tigers were reported when they weren’t there and the tendency to over estimate the power of armour by the infantryman. This idea is replicated in the NUTS! 2HW ruleset. A selection of ‘Cops and Robbers’ by Elhiem, they’ll find themselves in a variety of modern games. 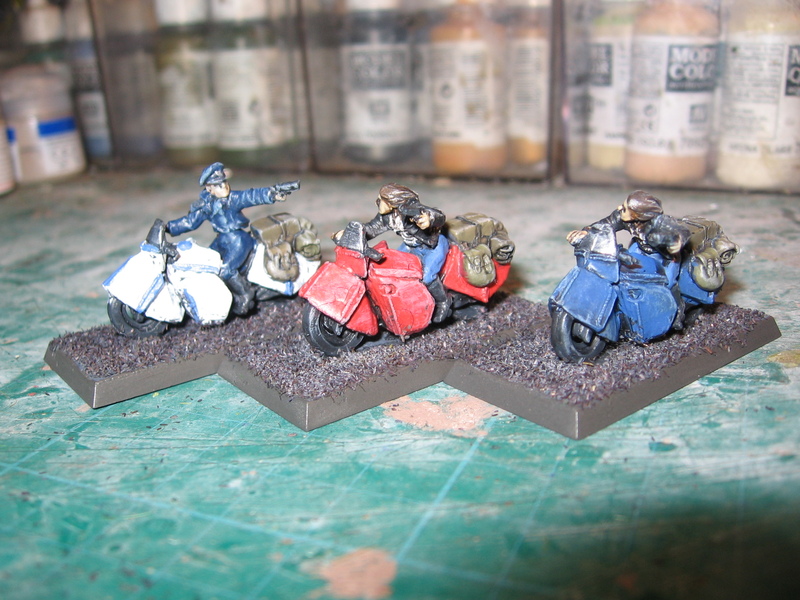 Some old Dark Future bikes. Some more Dark Future infantry for my collection. All Dark Future items are commanding high prioces on ebay at the moment. 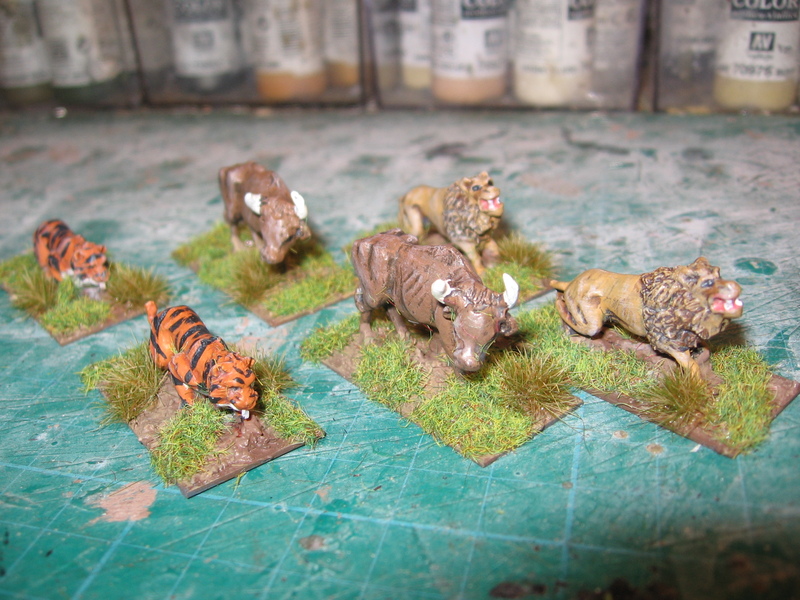 2 Lions, 2 Tigers and 2 Oxen by Irregular miniatures. 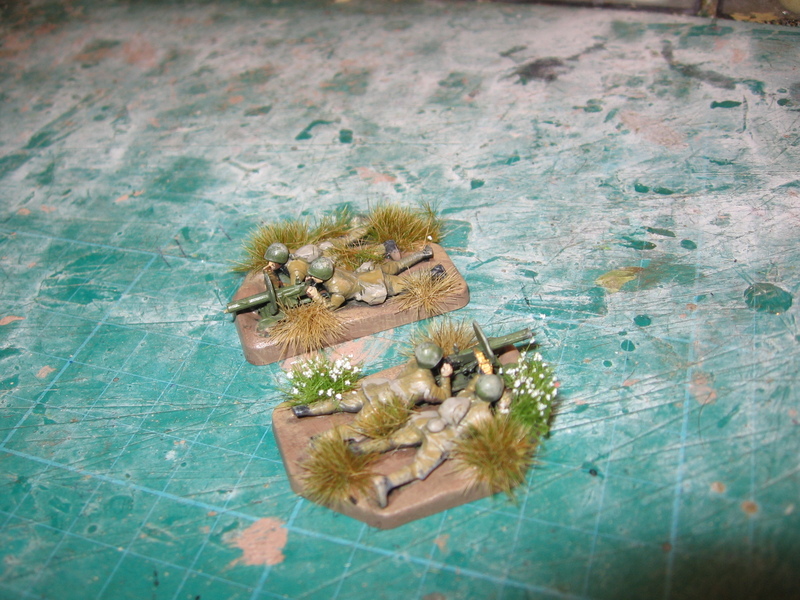 The last three items will hopefully feature in a forthcoming 2HW ‘After the Horsemen’ game… watch this space. Pretty Pictures- Poor Game, a Cold War what if? AAR. Last Monday I put on a game for Evan and Chris. As you’ve probably guessed by this post’s title it didn’t go particularly well…. 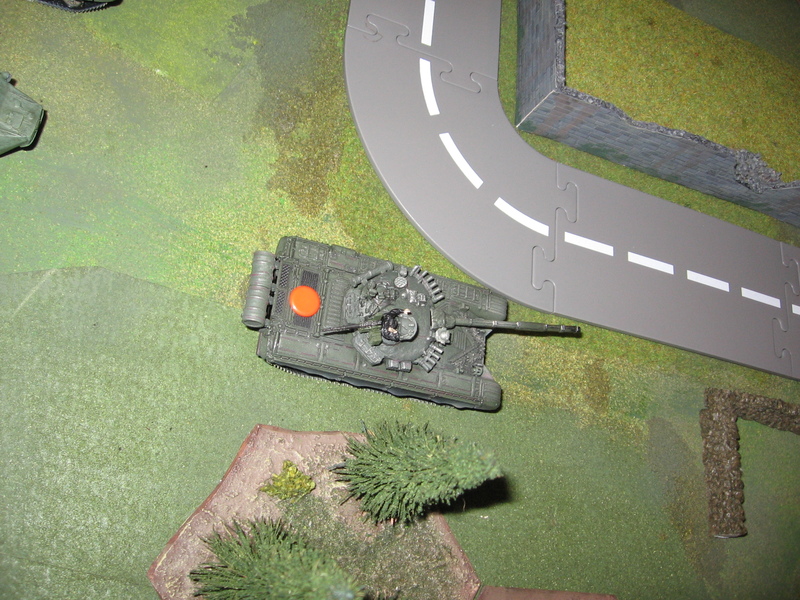 I wanted to try out a few more combinations from my Cold War stats, I pitted a platoon of T72s and Soviet infantry, again a platoon’s worth, carried in BTR60PBs against a pair of BAOR Chieftains and 2 sections of dismounted infantry defending a section of road. Sadly my stats need more looking at- whilst it was a poor game (apologies guys) it was an excellent playtest. I’ll put up the pretty pictures first then post- mortem afterwards. 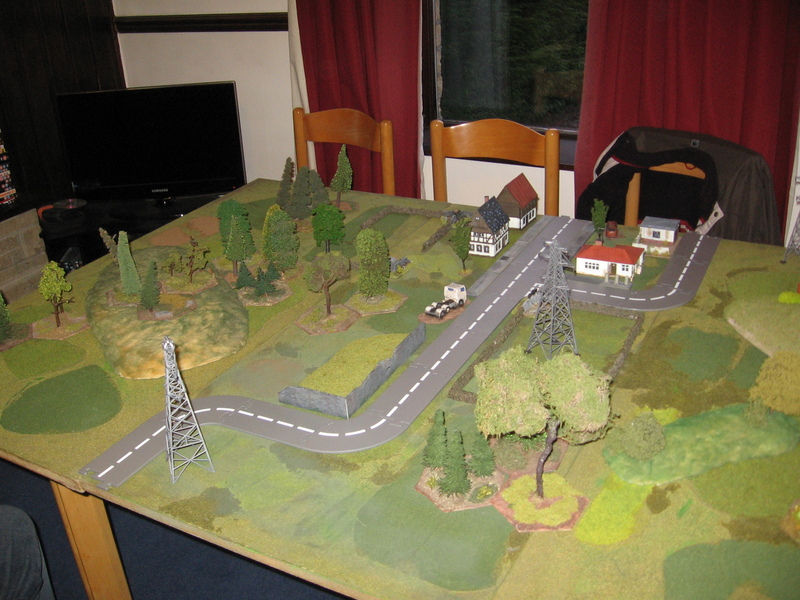 The table- the scenarios was to fought across the width this time. The opposition – the tiddlywink is a ammo status marker. The view from the Soviet base edge. 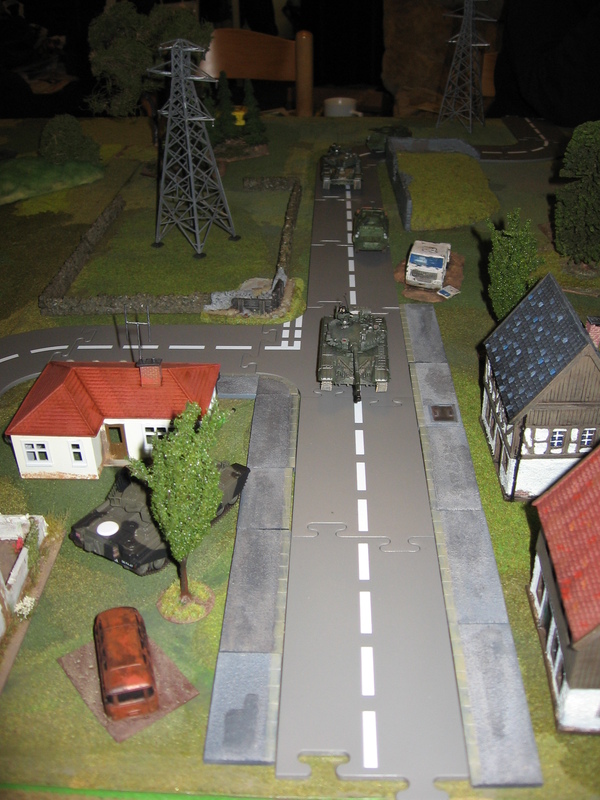 General overview- by this stage both British tanks had gone. End of the game with the Russians in the village. The new roads look great- not perfect but given the cost I’m more than happy with them. (I saw them on either a blog or forum- can’t remember which or who posted them- but who ever you were many thanks for the heads up. They were cheap toys from Sainsbury’s.) Especially as they fit next to the Ainsty pavements so well. I’ll pick up more of those at the next show I’m at. The changes I made to the vehicle damage charts worked well as well. This is one addition we’ll be keeping. 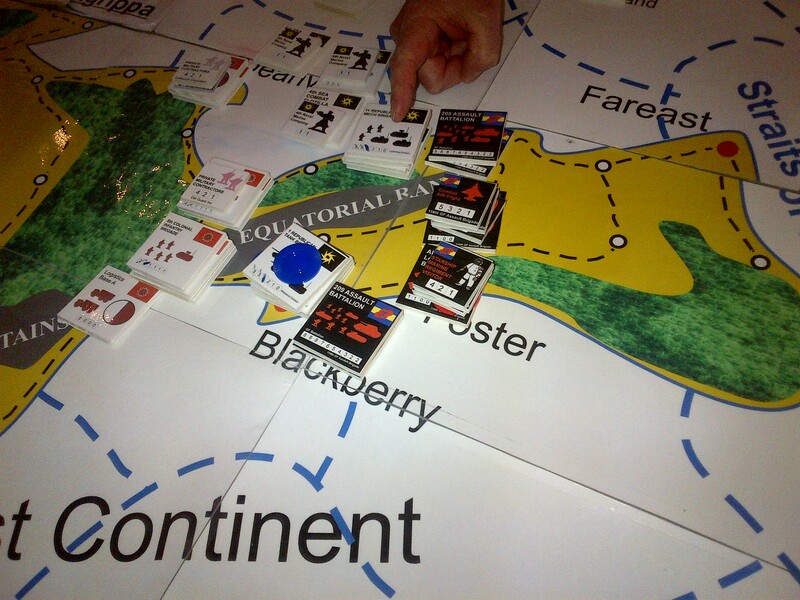 The game failed because the stats I had generated for the game meant that the British were at a severe disadvantage. I tried to make a short cut by only having one APR rating per vehicle rather than per shell but given the length of time they were in service and the different shells that could be used I think that it needs to be included. Given I can’t see more than 3-5 tanks being used per side I don’t think that the extra book keeping will be to arduous. More research is needed on the main guns of the post war period: The British, 105mm and rifled 120mm, the German 120mm Smoothbore and the Russian 125mm. I had given the Russians a Milan as an off table asset, how ever as I didn’t fire we couldn’t see how it functioned in the body of the rules. So that will be added back into a future game too. Right a case of back to the books and research, the stats need a bit more polishing before they are ready. 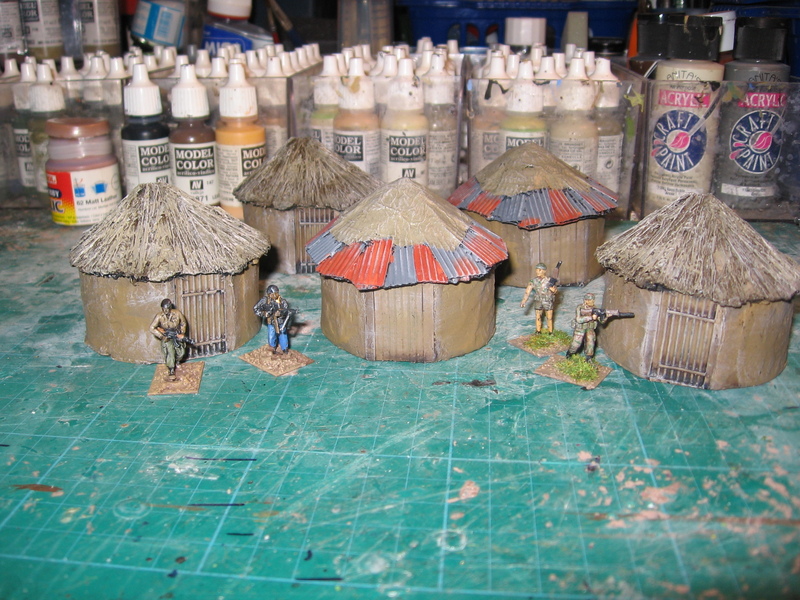 Mud huts. And better pictures of those ‘mystery’ guns. 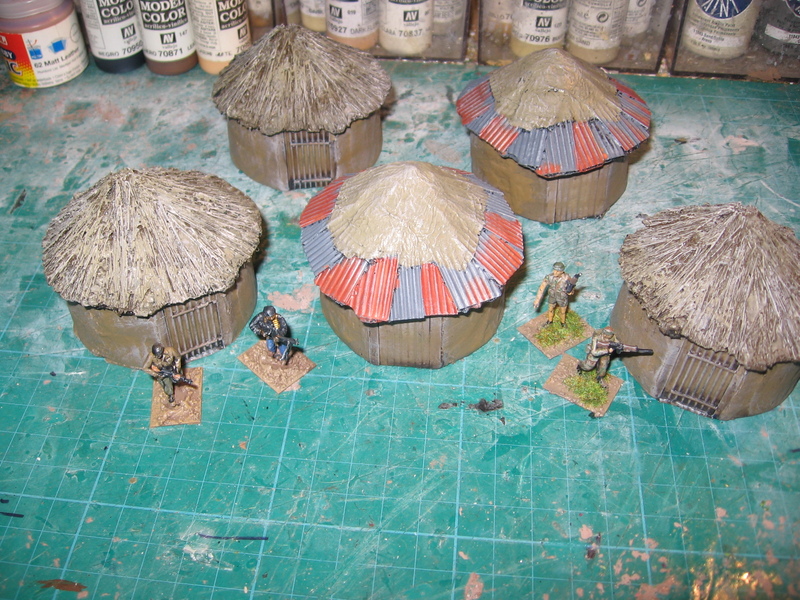 I’ve just finished these Mud huts from S and S models. Simple little pieces that will be perfect for my African projects, easy to paint up too. 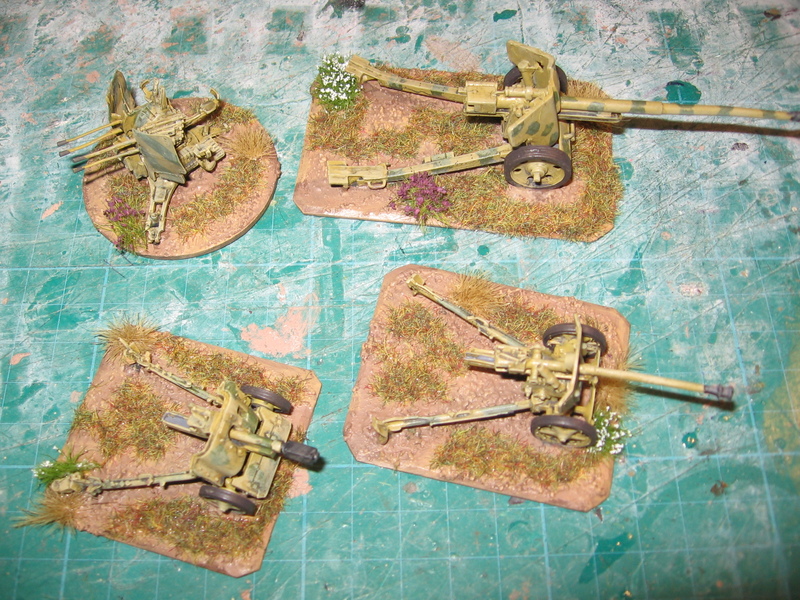 Also I’ve taken a couple more pics of the guns- the pack of sweets are still up for grabs…. 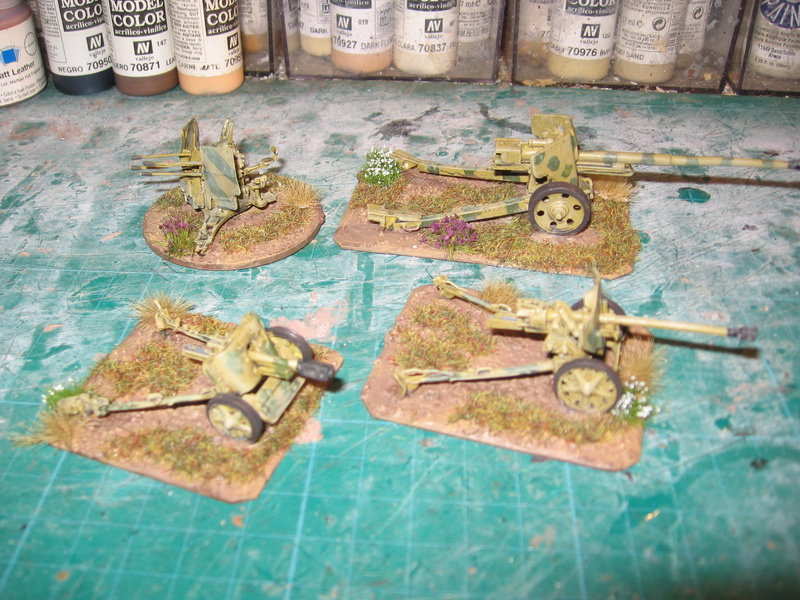 All of them can be found in Hogg’s ‘German Artillery of World War Two’ book. Top view, the uppermost pair are the obvious ones. Bit of another quiet quarter due to holiday, preparing my talk and the weather. 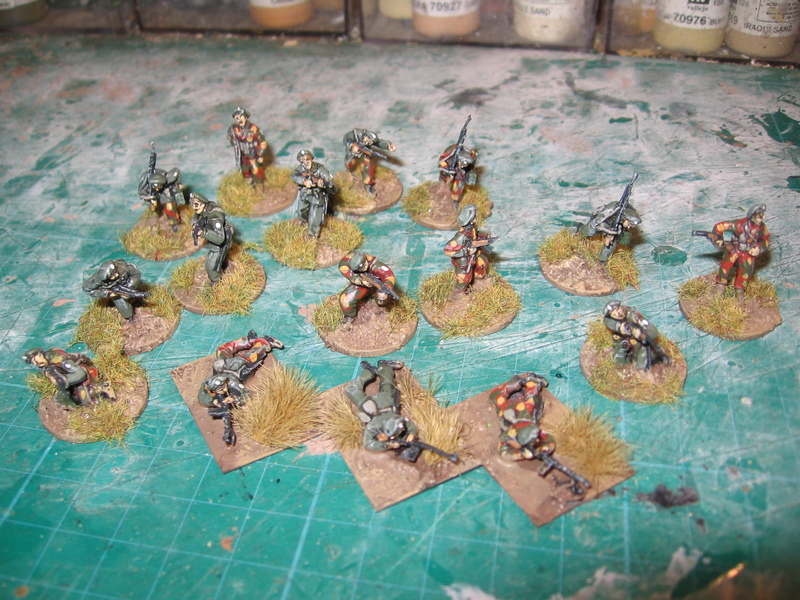 Still a last push this evening saw 16 figures and 3 kits finished off. Overall not too bad. Still want to better this by a large margin over the next quarter.